Last month I was in Taipei with colleagues from DEMAND thanks to funding from the British Academy International Partnership and Mobility Scheme and the Taiwanese Ministry of Science and Technology. In addition to workshops with the staff and students at National Chengchi University, our main collaborators, we also made visits to Taipei Medical University, National Taiwan University iNSIGHT Centre, and a local non-profit called HAND: Humanity, Alternatives, Nature, Dialogue. The trip was full and fruitful, and offered many opportunities to reflect upon the themes of our research as they were manifest in a different context. More information about our trip can be found on the DEMAND website, and on Storify. In the 1994 Lonely Planet guide to Taiwan, Taipei was characterized as a “boom town” with “overcrowding, noise and incredible traffic jams” (126). Planning for a Metropolitan Rapid Transit system began in 1975, but was plagued by delays, difficulties and bureaucratic obstacles (ibid., 170) that led to worries that it would “be obsolete by the time it’s completed” (126). Since then, however, significant improvements to infrastructure and public services have transformed a once-chaotic system into another aspect of what locals praise as the ‘convenient’ Taipei city. The city’s MRT (Metro) opened in 1996 and has been growing since then, with the latest section opening in 2013 and more lines set to open in 2015. The ‘U-bike’ shared bike scheme started as a pilot in 2008 and reached over 500 million passengers by June 2013. Taxis are also plentiful and inexpensive – with a ten minute ride costing as little as $150NTD/£3. Yet more striking when in the city are the scooter/mopeds, which are parked in orderly lines on many streets and crowd into special portions of intersections during rush hour. For the locals we spoke with, car ownership was largely unnecessary in Taipei, though it is still important in more rural parts of Taiwan, because other means of getting around are sufficient for many purposes. Moreover, the falling of real wages over more than a decade has made scooter ownership more practical for many in younger generations. 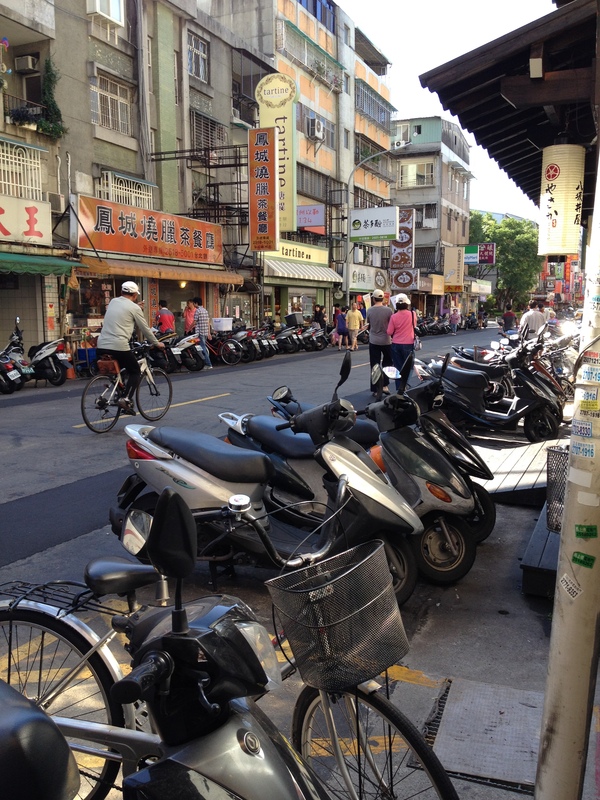 The infrastructure of Taipei city streets, which vary from multi-lane thoroughfares to small lanes that would barely fit one car, also call for and support the usefulness of scooters, which provide a means of getting around both queues of traffic on main streets and queues of pedestrians that clog the small lanes of Taipei’s many night markets. A few days of casual observations also demonstrated that the use of these technologies has become a thoroughly ordinary part of everyday life. 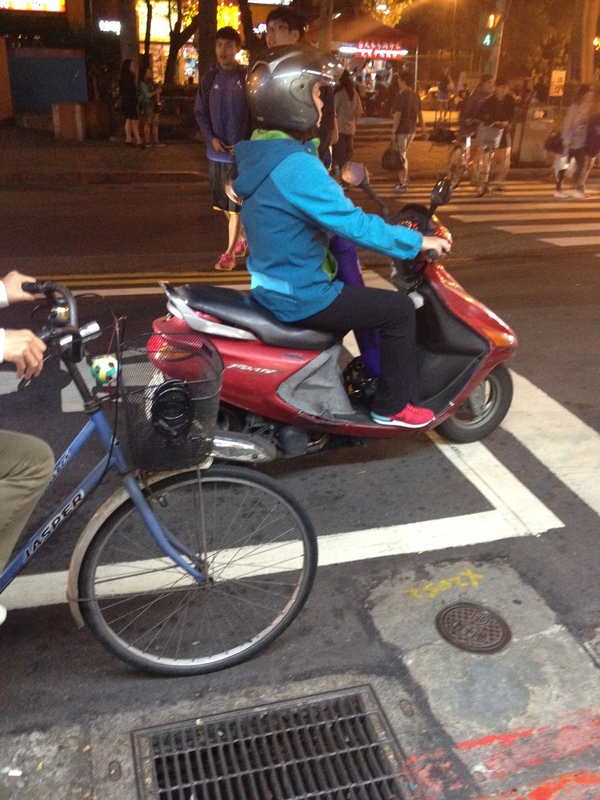 Though Taiwan receives twice as much rainfall annually as the UK, this didn’t appear to be a reason to avoid scooters, as we saw people riding in the rain with the protection of ankle-length raincoats. Scooters are also well-adapted, through skill as much as design, for carrying a large range of items. In some cases they are fitted with plastic boxes or crates behind the driver, or adapted to have cargo-sidecars. But in many other cases, people travelled with things between their feet on the small platform of the vehicle. Many models had small hooks that could be used to ensure handbags, backpacks and shopping bags don’t shift or fall off in transit. But in other cases this space was used for extra helmets, large bottles of drinking water, suitcases and yoga mats. In some instances, the space was used for additional passengers – for instance with children standing or sitting on a small plastic stool. Given recent findings from DEMAND’s Theme 1 (Mattioli and Anable) about the car-dependence linked to walking dogs, it was also interesting to see multiple instances where small dogs were catching a ride in the space between their owner’s feet. While the transformation of public transportation and normalization of scooters in Taipei undoubtedly brings complications as well as conveniences, it raises interesting questions in relation to UK government promises for reductions in carbon emissions. As I discussed in my presentation at National Chengchi University, perhaps our imagination has been too limited when thinking about how technologies like electric vehicles could transform our transport system. What if we didn’t automatically assume that EVs will be used in the same way as ICE vehicles? What if we allowed ourselves to imagine a future where scooters, or some other type of vehicle, were normal? How could the transformation of Taipei’s transportation system provide possibilities for thinking about steering change elsewhere?